Have you ever wondered what makes data useful and meaningful? In the beginning, when the only thing before you is a sprawling set of data, it feels simple and honest, but doesn’t exactly say much. However, the moment you analyze or visualize it, it evolves into information and starts conveying message. And it’s important to make sure that message reflects and aligns with what you’re trying to communicate. Why? Data can be a powerful weapon to be wielded when discussing strategic business directions, work results or negotiating with your managers and teammates. After all, properly analyzed data is what you should be basing your crucial business decisions on. So make sure your data visualization clearly illustrates what this data stands for and is easily understandable. Because the better you understand your data, the better you can communicate it to others. In this article, we’ll be laying out five rules that can help you maintain clarity in data visualization and communicate your insights to a wider audience. And to do that—you need to have specific questions as you analyze your data. That’s why the key to meaningful data visualization is the exploration phase—and making the right connections between the numbers and the real world. Ask yourself what you want to know about your data. Then try to think of what people reading your graphs or charts will be looking for. The more specific you are, the better. Decide whether you prefer to explore and highlight the best (biggest, highest) or the worst (smallest, lowest) elements, compare specific data points, or maybe examine a trend over time. If you have a complex data set—like a spreadsheet with multiple rows and columns—it might be difficult to decide what to look for, and where to look first. That’s what Nathan Yau, an expert in statistics and data visualization, calls data drowning in his book Data Points: Visualization That Means Something. To avoid it, you first need to learn to swim. Start at the shallow end and then go deeper. what visualization methods should you use? what do you see and does it make sense? He recommends a very logical way of processing this data. First, choose the right data and only then find the right visualization method for it (like a bar chart, pie chart, treemap, line plot, or scatter plot). Only this way will you be able to find a match and make the answers to your questions clear. Data visualization may seem like it’s all about the numbers. 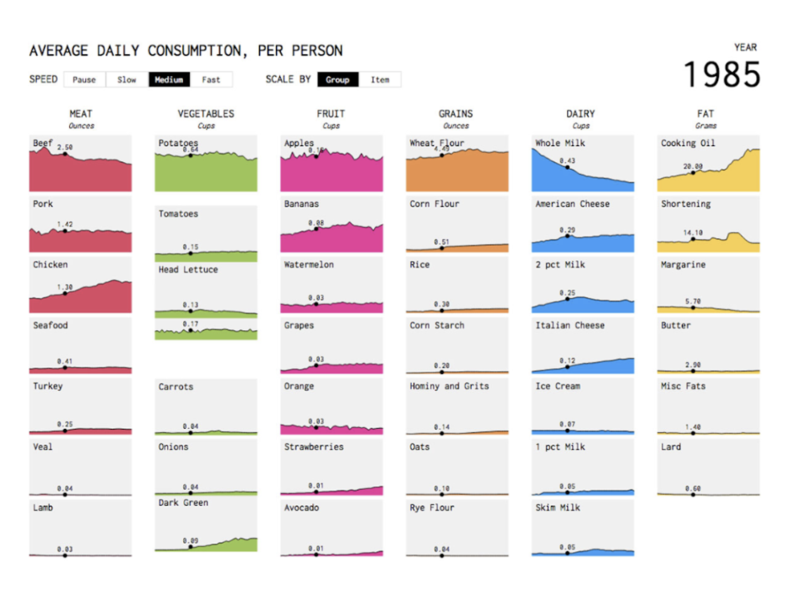 But to visualize data in such a way that it tells a story, you need words. Explain the data to people to help them understand it. It’s easier when your chart is presented in an article or book, surrounded by text. But when it stands on its own—as an infographic, report, or presented on a dashboard within an app people use, you need to make sure each of your data points and the relationship between them are completely clear. label your data points directly instead of using legends—like in this example by Nathan Yau. Visual hierarchy is the way you organize your visual elements, which also implies how important each of them is. It’s the order in which we perceive things, and it’ll help people make sense of your data and follow the story you want to tell. Flat and uninspired graphics that lack flow make it harder for people to make sense of your data. distance and space—elements that stand alone, away from groups of others, will be noticed first. This simple infographic shows how you can use them and what difference they can make. What can (and should) influence your visual hierarchy are online reading patterns—the way people read and scan text on a Web page. Following these patterns will help you place important elements strategically, to best capture people’s attention. This follows from your visual hierarchy. Highlighting can guide your readers through the data and draw their attention to the most significant parts of your graphic. To keep your data clear, make sure the extra elements you introduce don’t conflict with your visual hierarchy. Make your data points easy to compare. This is the main reason for visualizing data—it's much harder to compare data points listed in a table, but translating the data into lines, bars or dots will allow the reader to easily see how they relate to each other. Just make sure you use greater contrast between them, introduce some additional visual elements for emphasis, and use length as a visual cue. Remember to use hues different enough to easily distinguish between them and keep color-deficient people in mind. It makes reading and understanding data much easier. You can introduce it by either using words surrounding your chart or certain visual elements. One example of using familiar visual cues to provide context can be found in most maps showing political preferences in the US. Using the two colors commonly associated with both parties provides familiar context and immediately gives the data appropriate meaning. Flipping the colors (or using different ones) would make the data much more difficult to read. As Nathan Yau points out in his book, clutter is the enemy of readability. If you pack a lot of things into a small area, you’ll make it much harder for people to read your data. In his book, Yau provides another example using the US map—a visualization of fatal car crashes in the US, which is an excellent illustration of the fact that sometimes, data points are just as important as their data-less counterparts. On the first map, smaller dots and negative space help see the roads but also visualize road density across the country, making it immediately visible where there are fewer roads and fewer people driving cars. The second map has no negative space, making the data pretty much useless. People often think about data visualization as a design challenge. But there’s more to it than meets the eye. Data and its meaning comes before aesthetics and user experience. If you can’t connect the dots while creating your graphs, charts, or dashboards—your audience won’t either. And that’s not something we tend to keep in mind when talking about data visualization. If you have interesting examples of great (or poor) data visualization, share them with us in the comments.